Welcome to the official website of Dr. Graham’s Homes, Kalimpong. It is a pleasure for me as the Principal, to introduce the Homes to our many visitors who come to Kalimpong every year to see at first hand, the work of this great institution. It is similarly a great pleasure for me to welcome the many “virtual” visitors who visit our website to get a glimpse of this very unique institution founded in 1900 by Reverend Dr. John Anderson Graham, an institution that has been caring for children for more than a century. Dr. Graham’s Homes was founded in 1900 by the very Reverend Dr. John Anderson Graham, a Church of Scotland missionary, who settled in Kalimpong and worked with the local community for several years during the early part of the 20th century. His original concept was to establish a refuge for poor and needy Anglo-Indian children, who had no other means of support. When he established the Homes, it is doubtful that he could have ever imagined what the institution would be like in the 21st century. Dr. Graham’s Homes, in the 21st century, is a modern boarding and day school that provides quality education to over 1400 students. The School caters to children from Nursery to Class Xll and is affiliated to the Council for the Indian School Certificate Examination. It is also a member of the Anglo-Indian Schools Association. The staff and management team of Dr. Graham’s Homes place great importance on academic achievement of all the students as well as on their wholesome and all round growth and development. The teaching body has a wide range of academic qualifications and this is reflected in the curriculum on offer. All subjects are taught in English and students are expected to speak English at all times whilst on the campus. This provides them with an opportunity to become fluent even if their first language is not English. The school attracts students from all over India, Bangladesh, Thailand and Bhutan as well as other countries in Asia and Europe. There is a truly international feel about the place which helps to develop a real pride in learning. 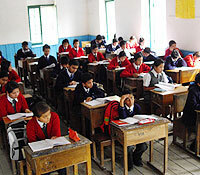 The school offers eight second languages; Hindi, Nepali, Bengali, Dzongkha, Tibetan, Khasi, Lushai and Thai. The learning process starts the moment the children are admitted to the Lower Kindergarten through a combination of play and formal learning techniques. As they progress through the Junior School and into the Senior School, students are prepared for important certificate examinations, which provide a passport to future learning and employment. Students in the Senior School are divided into three streams – Arts, Science and Commerce – and are encouraged to make their choice so as to excel in areas of their greatest individual strengths. Well qualified and experienced staff use a range of teaching methods to enhance the learning environment. In addition, the School offers spacious classrooms and boasts of well equipped science laboratories for our Science students studying Chemistry, Physics and Biology. Our Arts students have the advantage of good stage facilities with ample rehearsal space and a well-equipped art room. Our Commerce students have access to computers with modern teaching packages. Senior students in all streams have access to the Graham Computing Centre, which offers a 32-networked computer facility with qualified technical support staff. The institute is increasingly offering computer based learning across the whole school from the Junior classes upwards and this state-of-the-art Centre is an important tool in the drive to modernise the curriculum. Our boarders live in cottages built across the campus. Cottage life is supervised by staff who assume the role of Cottage “aunties” and “uncles” and children live in a family atmosphere, where young and old assist in the daily tasks of cooking and cleaning, learning to live together in harmony in the community. This is a unique feature, which allows the students of Dr. Graham’s Homes to learn to look after themselves and to understand the importance of both self-reliance and interdependence in adult life. The Cottages are the basis of much competition with sports, drama, debating, elocution, singing and even gardening being closely fought in the annual contest for Best Cottage. Day scholars are included in these activities as each student is assigned a Cottage and is expected to support the efforts of their boarder colleagues. In this way, we attempt at all times, to create a cohesive community of students. Dr. Graham’s Homes is proud of its long and distinguished heritage. We celebrate two very important dates in the calendar every year. The May Fair is a traditional carnival day with lots of interesting stalls where students can display their skills in art, craft and cookery, and performances by the School Band. The Fair also sees the crowning of the traditional May Queen by the Chief Guest who is always an important dignitary. Invitations go out to all parents and children to attend. It is during this time of the year that we also have the annual inter-cottage garden competition, an event which is closely contested as boys and girls, and staff, vie with one another to create the brightest and most striking floral garden displays. The second event is the annual Birthday Celebration marking the foundation of the School in 1900. Held in September, the celebration is spread over two days and includes the annual flower service at the Katherine Graham Memorial Chapel. Apart from parents and local supporters, the Birthday Celebration draws former students, friends and well-wishers from across the world every year. In addition, throughout the year, Dr Graham’s Homes takes part in an extensive calendar of sporting events jointly organised by local schools.